The rainy season in central Japan is unlike anywhere else I’ve ever lived before. Unlike the dreary endless rain of a winter in central Germany where I currently live, or the dramatic thunder and lightning storms of a summer in southwestern Ontario where I grew up, the Japanese rainy season or “tsuyu”, is quite refreshing. It is a steady rain that can last all day long, but the weather is warm enough to make it bearable. Armed with a large umbrella and water resistant shoes, one can go about one’s day-to-day life with ease. 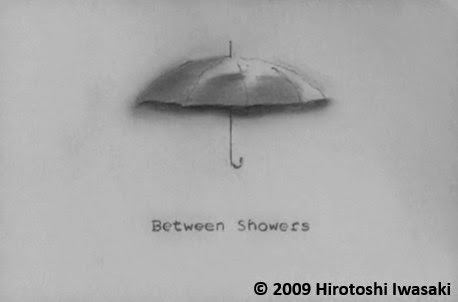 Between Showers from Hirotoshi Iwasaki on Vimeo. Hirotoshi Iwasaki (岩崎宏俊, b. 1981), uses rain as the central motif in his 2009 animated short Between Showers. It opens with the sound of a steady downpour. A young woman in a sleeveless dress pauses, then opens her umbrella. After the title, there is a lovely sequence of umbrellas opening like butterflies spreading their wings. Using what appears to be charcoal on paper, Iwasaki draws a series of typical vignettes of the season: salarymen with their jackets off with one man holding the umbrella for two, crowds of men rushing through the streets, an umbrella-less woman pulling a suitcase wraps her scarf around her head to protect her hair from the onslaught, a man walks at a leisurely pace with his umbrella chatting on a keiai denwa (cellphone), a man struggles to get his umbrella to open properly, and a police officer dressed in a long raincoat keeps an eye on the traffic. In an abstract sequence, people get swallowed up into a swirl of water. The film ends with a single umbrella. Iwasaki moves in and out of vignettes with ease, managing to convey the essence of spring / early summer rains with his spare lines. Between Showers won the Jury Prize at the ASK? Film Festival at Art Space Kimura in 2009 (Japan) and the Grand Prix at the Image Forum Festival 2010. Watch it on Vimeo.